I am so excited for this year’s International Women’s Day theme – #PressforProgress – a strong call to action for women and men to unite and press forward to progress on gender parity. The #MeToo and #TimesUp movements have given us momentum. Now, it’s time for each of us to do our part to propel change at every level. Why is #PressforProgress so important? Only 47% of entry-level hires are women. On average, women are promoted at a lower rate than men. The biggest gender gap is at that first step up to manager; entry-level women are 18% less likely to be promoted than their male peers. 1 in 5 C-Suite leaders is a woman, and less than 1 in 30 is a woman of color. So here’s the bottom line – nearly half of us are not invited to the party. When we are fortunate enough to gain admittance we only experience general admission, never behind the doors to VIP. For the precious few that do get promoted to the upper echelons, it’s often a lonely experience because we are the only one. For many it’s a frustrating experience – especially when you compound it with the fact that we are paid 81-cent on the dollar compared to men, and nearly 1 in 3 of us ages 18-34 have been sexually harassed at work. It sounds overwhelming, but I believe real change can occur if we all press forward. Below are some ideas to get us started. I’d love to hear your thoughts too. Close the confidence gap. We are smart, strong and wholly capable to lead. Trouble is – we don’t always believe it. Research has shown that when compared to men, we have significantly lower self-esteem, and I get it. From the womb to the tomb there is a war on our self-worth. Click To TweetEvery season of life there are external messages shouting from the rooftop that we are not enough. That coupled with our own internal doubts is enough to have us second guessing ourselves, wondering if we can do more. The great news is YES WE CAN. Increasing our confidence is an inside job, and there are some practical steps we can take to succeed. Check out my blog post from last week for some tips on how to get started. Connect with other strong women. Together we can do so much more. Often we feel like we’re the only one struggling, or we actually are the only one at our jobs. I can’t tell you how often I have been the sole woman of color at the table. It can be a lonely, deflating, and frustrating experience if you don’t have sister-friends to support you. Listen whether you are an entrepreneur, executive, or stay at home Mom we need each other to thrive. We need friends to encourage us, mentors to counsel us, and sponsors to open doors we don’t even know exist. The problem is most of us are over networked and under connected. Our relationships are broad but not deep, resulting in superficial connections that don’t go the distance. The key is to curate your inner circle. I walk you through that in my FREE course – 5 Steps to Get in the Driver’s Seat of Your Life. I promise, this one exercise will transform how and with whom you build relationships for the future. Continue to build your skill set. People who read succeed. Why? Because they foster a love of forever learning, allowing them to more quickly adapt to a changing marketplace and workforce. I see this missing a lot in young leaders, particularly at the manager or director level. You’ve achieved some level of success, but you’ve stopped honing your leadership skills – assuming your performance alone will get you promoted. But the reality is performance alone rarely leads to advancement, especially after that first rung on the leadership ladder. Here is the formula that has worked for me – Prepare, position, perform, repeat. This is why I am passionate about teaching women leaders how to prepare and position themselves, and other young leaders they are mentoring. 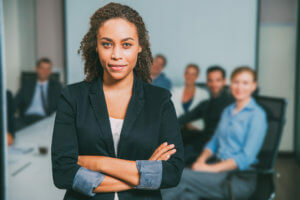 In my leadership course – 12 Steps to Become a More Confident, Effective, and Empowered Leader – we teach you how to do this in a way that maximizes your impact, and builds your executive presence. Commit to supporting other women. Now that the conversation around sexual harassment is out in the open, we have to keep up the pressure until we see change. For years it has been swept under the rug as “boys being boys” but no more. It is unacceptable, and if we are to foster a safe environment where women feel secure enough to speak up we must support each other. I created a short video outlining 3 things we CAN DO to stop sexual harassment in its tracks. If more of us stand strong, the abusers will no longer have a protected space to operate. Compulsively practice self-care. To #PressforProgress we must be powered up. This work isn’t easy, but it is doable. It takes persistence and perseverance to break down barriers, and shatter the glass ceilings that keep us boxed into spaces that are too small for our spirit. That’s why it’s important that you be maniacal about #365SelfCare. Not as a treat for doing a great job or working yourself to the ground, but as an everyday intention to protect and preserve your sanity and peace of mind. If we want to be our best, and continue fighting for what’s right, we have to get our rest. Ladies, if we’re going to transform the way the world treats women we have to be in it for the long haul. We’ll lose some battles along the way, but as long as we’re making progress toward our bigger goals we can enjoy the journey. Don’t get caught up on looking at everything that needs to be done and give up hope. Focus on what you CAN DO today, and let’s take those small steps that eventually lead to big rewards. This is our season to shift the atmosphere. What will you do #PressforProgress? The world is waiting for your brilliance to lead the way. Let’s together be a powerful and positive force for good.